Get Certified once …and recognized by many. One process and one fee is used to allow you to become officially certified and recognized by several OEMs and consumer-facing organizations. This Certification process employs an exclusive online application process followed by an on-site inspection to ensure proof of compliance. Once you are sure you are able to meet the requirements, you will schedule an appointment with an inspector in your market area. The inspector will document all of the certification requirements with proof of compliance as required. Receive Certified Collision Care Provider credentials! 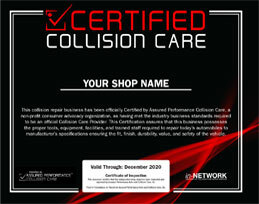 Upon certification your facility will be provided with marketing tools including a Certified Collision Care sign. Receive official OEM Certification by Fiat Chrysler Automobiles Canada! 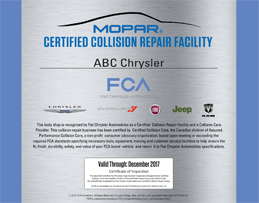 Upon certification, your facility will be officially designated as a “Mopar Certified Collision Repair Facility” and be able to access exclusive FCA marketing tools and signage. Receive official OEM Certification by Ford Motor Company of Canada! 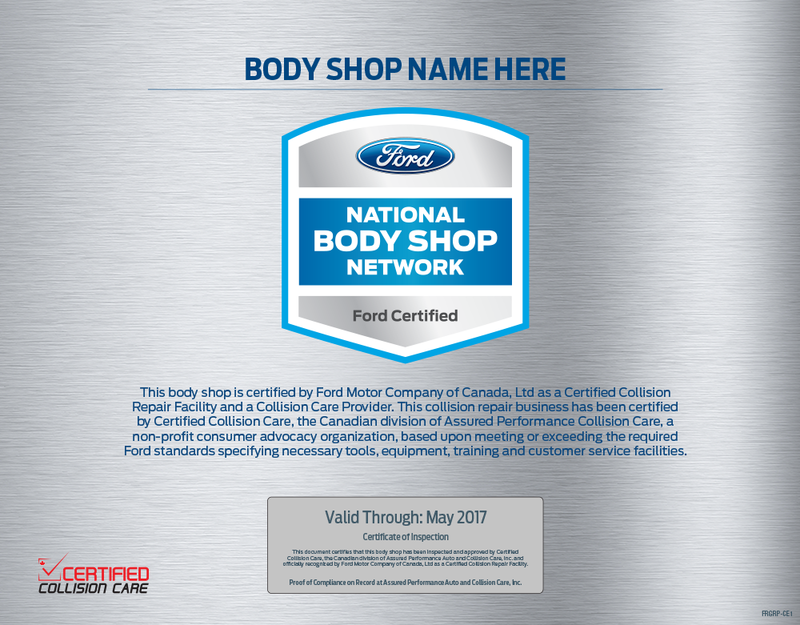 Upon certification, your facility will be officially designated as a “Ford National Body Shop Network Certified” facility and be able to access exclusive Ford marketing tools and signage. Receive official OEM Certification by Nissan Canada! 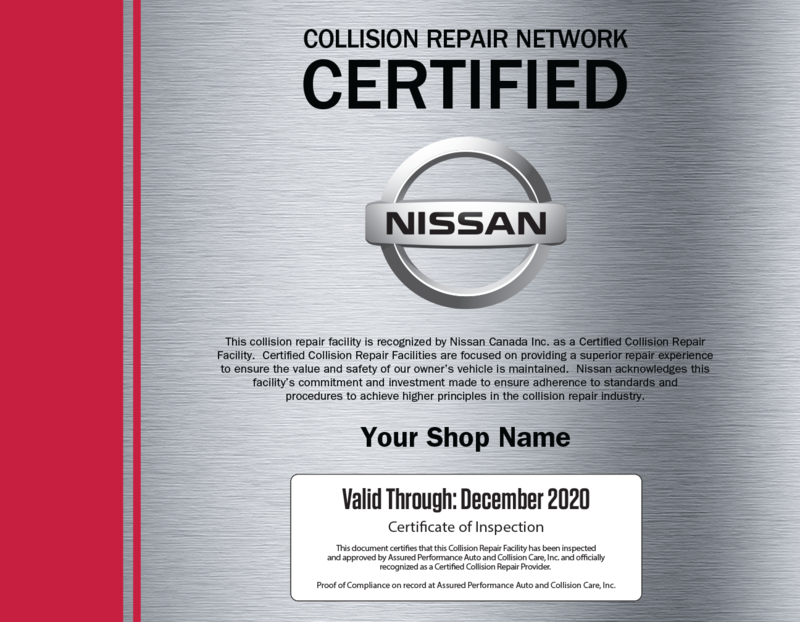 Qualified Certified Collision Care providers will be designated as a Nissan Certified Collision Repair Network facility and be able to access exclusive Nissan marketing tools and signage. Receive official OEM Certification by Kia Canada! 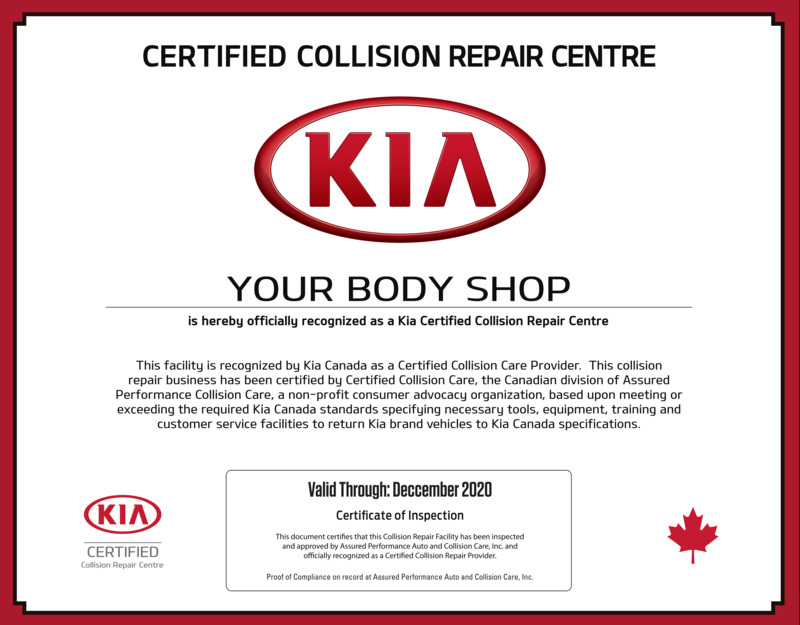 Upon certification, your facility will be officially designated as a “Kia Certified Collision Repair Centre” and be able to access exclusive Kia marketing tools and signage. Receive official Toyota Canada Certification! 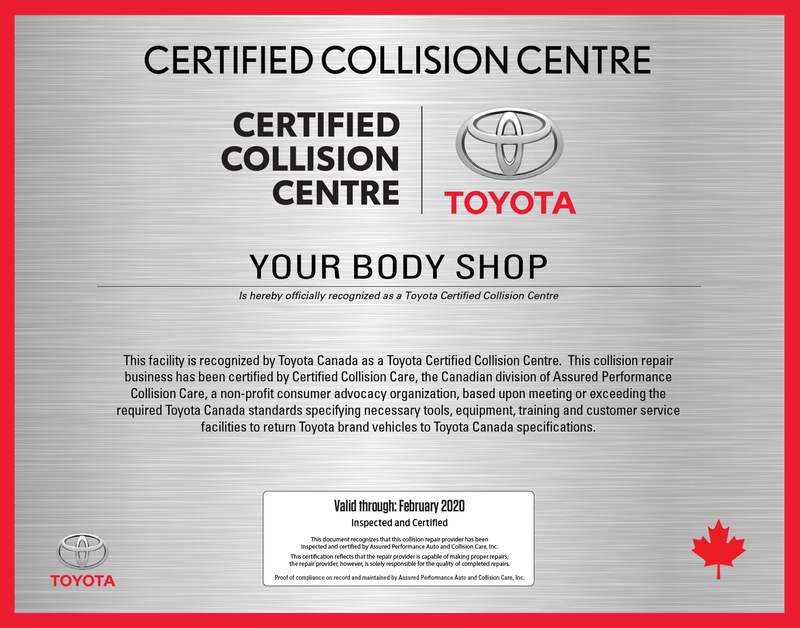 Qualified Certified Collision Care providers will be certified by Toyota Canada, and will receive special Toyota Certified Collision Repair Network signage for interior use. Receive official Lexus Canada Certification! 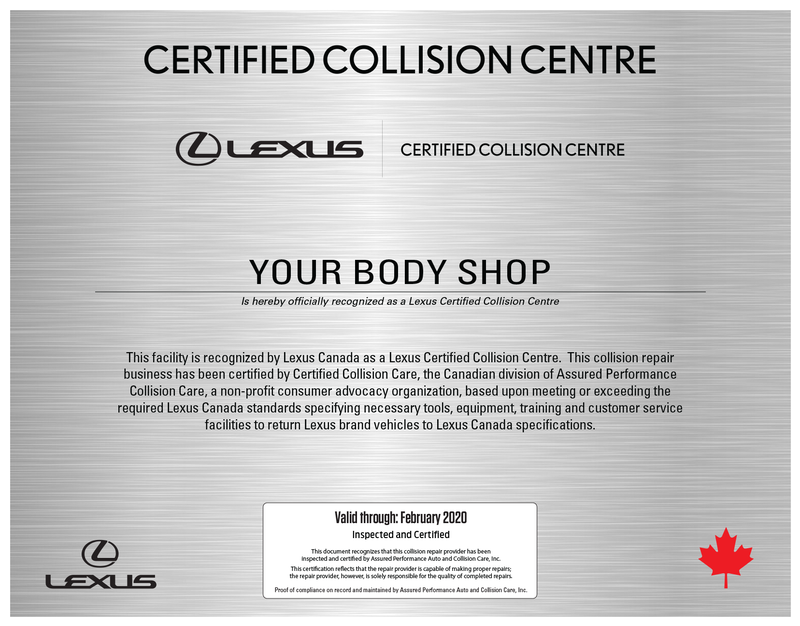 Qualified Certified Collision Care providers will be certified by Lexus Canada, and will receive special Lexus Certified Collision Repair Network signage for interior use.